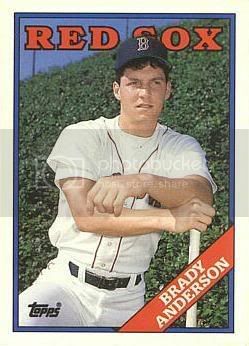 Brady Anderson was an outfielder who played for Pawtucket in 1987-88 from age 23-24. In 1987, Anderson batted .380 in 23 games. His OBP was .484. In 1988, Anderson batted .287 in 49 games, placing him 11th overall in the IL. All told, in his time in Pawtucket, he hit only 6 home runs. What an innocent time for Brady! 2. In '88, Baseball America picked Anderson as the top rookie prospect in the AL East. Brady Anderson's trim, uninteresting physique is located in the upper portion of the first base tower.